The On Duty® FST-1103SK Fire Safety ToolThe On Duty® 4 in 1 Emergency Tool™ , 515100, A light-weight, heavy duty, easy-to-use tool which Shuts off Gas, Shuts off Water, Pries Open Doors, and Digs through Debris. This tool will help you prepare for any emergency. The 4 in 1 Emergency Tool™ shuts off gas valves quickly. This special patented design allows maximum leverage and comfort to allow you to act safely and quickly on most regular gas valves. The special slotted handle allows you to shut off larger commercial gas valves. The 4 in 1 Emergency Tool™ is designed to shut off water meters too. This special design fits on most water meter shut off valves. Water may be shut off from the street, away from the home or building. The 4 in 1 Emergency Tool™ also pries open doors, cabinets, and other openings to allow you to get into areas that have been damaged during a disaster. This special patented prying feature allows maximum leverage for quick access. The 4 in 1 Emergency Tool™ allows you to dig through debris safely and effectively. The special patented rubbish claw can help you get to covered supplies or victims. Made of tough high quality heat treated metal compounds used in the Aerospace Industry. The “4 in 1 Emergency Tool™" was expertly designed to: Shut Off Gas, Shut Off Water, Pry Open Doors, and Dig Through Debris in Emergency Situations. The “4 in 1 Emergency Tool™" was carefully crafted using only the toughest, highest quality materials to ensure safety and reliability. This tough, heat treated tool, won’t rust or spark, is made of the same High Quality Compounds used in the Aerospace Industry and tested by Professional Firefighters. 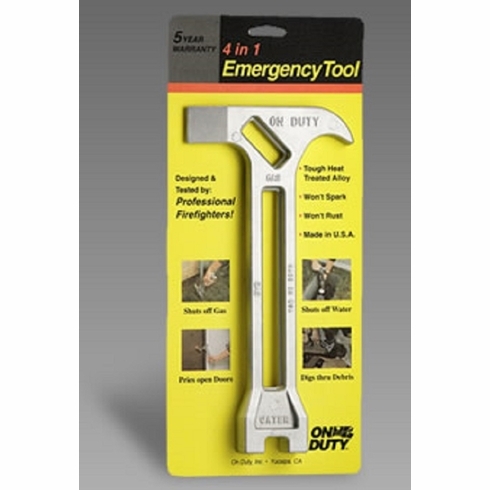 The "On Duty® 4 in 1 Emergency Tool™" is approximately 11 inches high, 5 ½ inches wide and 1 inch deep. It weighs less than 1 pound and is used by Firefighters, Law Enforcement, Community Emergency Response Teams (C.E.R.T.) and Rescue Teams throughout the USA. Using the “4 in 1 Emergency Tool™" will help you prepare for any emergency. 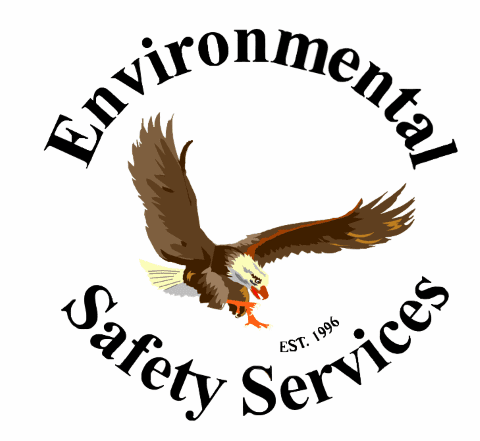 When faced with an earthquake, tornado, hurricane, severe storm, or other life-threatening disaster, it is essential to be able to perform certain life-saving tasks. 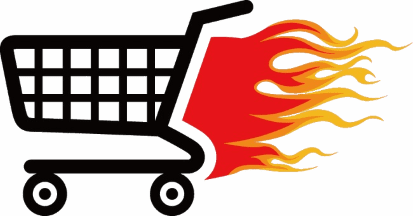 Turning off your gas valve may be necessary to avoid an explosion or fire due to a gas leak. Equally important, you must be able to turn off your main water valve in the event of a break in a water pipe, which could result in severe flooding of your home or business. The "On Duty® 4 in 1 Emergency Tool™" is also MADE in the USA and helps provide jobs to America’s Disabled.